Amid major debates over energy and environmental policy changes, Americans tilt toward supporting government regulations as the best way to encourage renewable energy development, believe that reliance on solar and wind power are effective in minimizing pollution, and are less convinced that pro-coal and pro-oil policies are viable antipollution strategies. But the public is divided on the core question shaping the debates in the early period of the Trump administration: Is it possible to cut back environmental regulations and still effectively protect water and air quality? Some 49% think it is possible to trim regulations and still protect air and water, while 47% believe it is not possible to protect those resources with fewer regulations. These views differ widely by political party. The survey shows that 54% of U.S. adults believe the Trump administration is doing too little to protect the environment, while 30% think the administration is doing “about the right amount” and 5% believe it is doing too much. There are largely predictable partisan differences in the public’s answers on most of these energy and environment issues, but in some cases there are no divides between partisan groups or only modest ones. 88% say solar power is “very effective” (68%) or “somewhat effective” (20%) in minimizing air pollution. 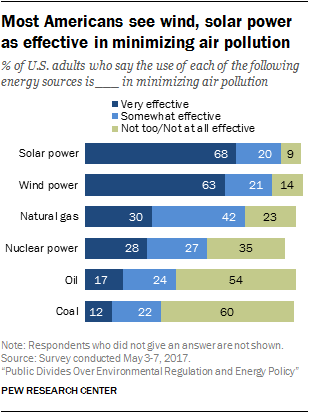 84% think wind power is very (63%) or somewhat effective (21%) in minimizing pollution. Americans are less confident about whether other energy sources are effective in minimizing air pollution: 28% say nuclear power is “very effective,” though more, at 55%, consider nuclear power at least “somewhat effective” in minimizing air pollution. Some 72% of adults believe natural gas is “very” (30%) or “somewhat effective” (42%) in minimizing air pollution. Minorities consider either oil (41%) or coal (34%) at least somewhat effective in minimizing air pollution. These are some of the findings from a Pew Research Center survey conducted May 3-7, 2017, among a nationally representative sample of 1,012 adults ages 18 and older. There are wide partisan differences when it comes to prioritizing environmental protections and reliance on renewable energy sources, but only modest or no differences between political groups when it comes to economic considerations. For example, Democrats and independents who lean to the Democratic Party are about twice as likely as Republicans and Republican-leaning independents to want to ensure that energy development efforts are designed to prioritize environmental protection (68% vs. 32%). But when it comes to making sure the energy sector is creating jobs, Republicans and Democrats are hardly distinguishable in their views (about half in each group say this should be a top priority). Similarly, 54% of Democrats and Democratic-leaning independents say that consumer cost considerations should be a top priority for energy policies, as do 44% of Republicans and Republican leaners. 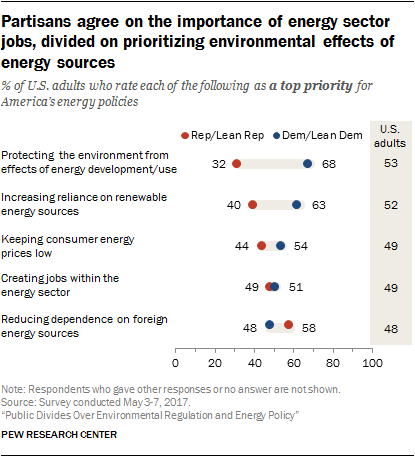 And about half or more of both party groups say reducing foreign energy dependence should be a top priority. 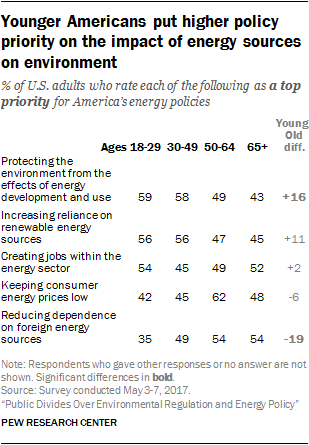 There are also some differences in energy policy priorities across generations. Adults younger than 50 are especially likely to believe that protecting the environment and increasing reliance on renewable energy sources should be top priorities for America’s energy policies. Similarly, a January 2017 Pew Research Center survey found adults younger than 30 placed a higher priority on the then-new administration protecting the environment. As expected, those with household incomes under $30,000 are especially likely to prioritize keeping consumer energy prices low (59% call it a top priority) but so, too, does a sizable share of those with a household income of $75,000 and higher (41%). Most Americans consider increasing reliance on renewable energy sources either a top priority (52%) or an important, but lower, priority for the nation (32%). But there are narrower divides over how best to encourage greater reliance on renewable energy sources. 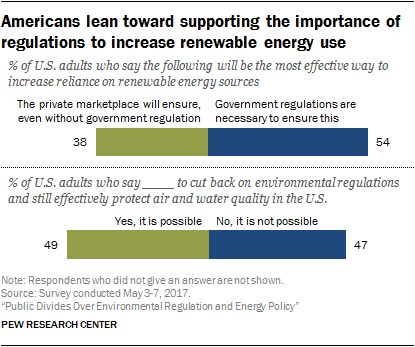 The survey finds 54% of Americans believe government regulations are needed to effectively increase reliance on renewable energy sources, while 38% believe the private marketplace will ensure greater reliance on renewable energy sources, even without government regulations. Democrats and Republicans take fairly different positions on this issue. About two-thirds of Democrats and independents who lean Democratic (65%) believe that government regulations are needed to effectively encourage more use of renewable energy sources; liberal Democrats are especially likely to hold this view (74%). 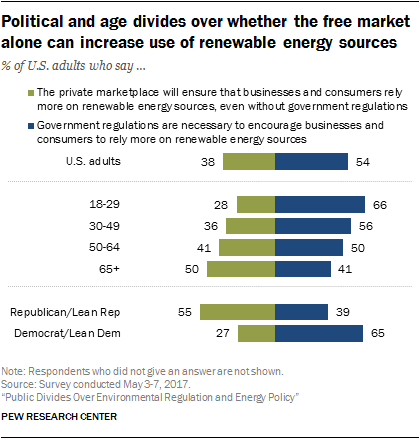 By contrast, among Republicans and independents who lean to the GOP, 55% say the private marketplace can be effective at increasing reliance on renewable energy sources, while 39% say government regulations are necessary. There are also sizable differences in views about this issue by age, with younger adults ages 18 to 29 especially likely (66%) to see government regulations as necessary. Seniors 65 and older, however, think the private marketplace is the most effective way to increase reliance on renewable energy sources by a 50%-41% margin. Differences by age hold even when accounting for the tendency of older adults to identify with the GOP. Supporters of increased reliance on renewable energy sources – energy generated from natural resources such as sunlight and wind – argue that a shift in this direction will reduce air pollution and will help address global climate change. The amount of air pollution emitted from the use of different energy sources varies widely. Solar power and wind power emit no air pollutants and result in no carbon emissions. Nuclear energy, while not a renewable energy, also emits no air pollutants. Natural gas emits smaller quantities of air pollutants than either coal or oil and results in less carbon emissions. Public perceptions of the connection between renewable energy sources and air pollution show that most Americans see both solar and wind energy as effective at minimizing air pollution. Fewer Americans see nuclear power as effective at minimizing air pollution. About half or more consider oil and coal not effective or not too effective at minimizing air pollution. Views of natural gas are in the middle. Some 68% of Americans say using solar power is very effective at minimizing air pollution; 63% say wind power is very effective in minimizing air pollution. By comparison, a minority of the public says that either oil (17%) or coal (12%) is very effective at minimizing air pollution. 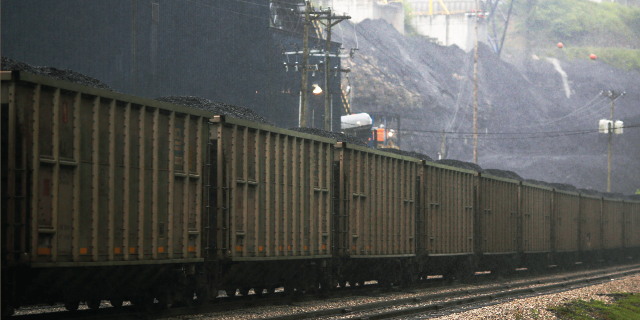 Six-in-ten Americans say the use of coal is not at all (36%) or not too effective (24%) at minimizing air pollution. About half of the public thinks oil is not too (26%) or not at all effective at reducing air pollution (27%). Perceptions of both natural gas and nuclear power fall in between. Three-in-ten Americans see natural gas (30%) as very effective at minimizing air pollution, 42% say natural gas is somewhat effective in minimizing air pollution, and 23% say natural gas is not at all or not too effective. Views of nuclear power are mixed, with 28% saying the use of nuclear energy is very effective, 27% saying it is somewhat effective and 35% saying it is not too or not at all effective in minimizing air pollution. Democrats and independents who lean to the Democratic Party are modestly more inclined than Republicans and Republican-leaning independents to say the use of solar or wind power is very effective in minimizing air pollution. Large majorities of Democratic leaners see solar power (77%) or wind power (72%) as very effective. 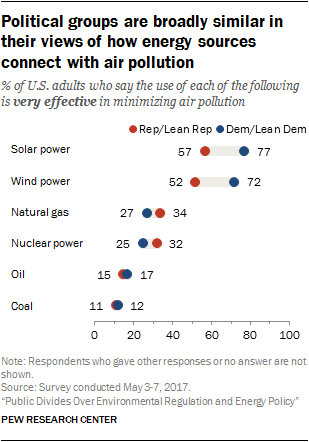 About half or more of Republicans and Republican leaners think solar power (57%) or wind power (52%) is very effective at minimizing air pollution. A 2016 Pew Research Center survey found that large majorities of both political party groups favor expanding solar panel and wind turbine farms. While a 2017 Center survey found wide partisan differences over prioritizing fossil fuel exploration over alternative energy sources, the current survey suggests this is not because they have a different understanding of the relative levels of air pollution each method entails. Republicans and Democrats are about equally likely to say the use of natural gas, oil and coal is very effective in minimizing air pollution. Further, the two political party groups have roughly similar perceptions of how nuclear power impacts air pollution. Some of President Donald Trump’s first actions in office included the promise of a shift in government regulatory policy on energy and the environment. The Trump administration has already implemented several changes to environmental regulations, including revoking a restriction on coal plants prohibiting dumping of wastewater into public waterways and ending the freeze on new leases for coal mining on public land. Trump’s proposed budget cuts to the Environmental Protection Agency suggest more changes could be still to come. Overall, 54% of Americans say the Trump administration is doing too little to protect the environment, 30% say it is doing the right amount and 5% say it is doing too much. Political groups have starkly different reactions to the Trump administration’s actions on the environment. Among Republicans and those who lean Republican, about two-thirds (65%) say the Trump administration is doing the right amount, while only one-in-five (20%) say the administration is doing too little. 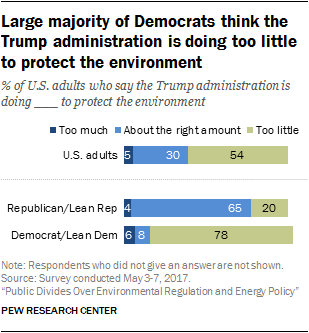 But among Democrats and Democratic leaners, the balance of opinion is the opposite: Only 8% believe the Trump administration is doing the right amount to protect the environment, while 78% say the administration is doing too little. When considering the broader question of whether it is possible to reduce environmental regulations while protecting the environment, there is a strong divide in public opinion. About half (49%) of the public says it is possible to cut back on environmental regulations and still effectively protect air and water quality, while a similar share (47%) says this is not possible. There are large partisan divides on this issue. 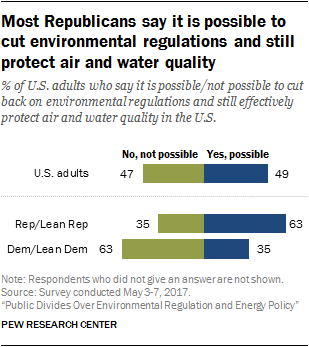 By a 63%-35% margin, most Republicans and Republican leaners hold that it is possible to cut back on environmental regulations and still effectively protect air and water quality in the U.S. Most Democrats and those who lean Democratic hold the reverse view: 63% say it is not possible to cut back on environmental regulations and still effectively protect air and water quality in the U.S., while 35% this is possible.